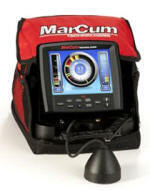 Soon after, advanced MarCum LX series ice-fishing flashers unveiled the first patented Adjustable Zoom, Interference Rejection (IR) and vivid TrueColor™ Display technology. The LX-5, LX-3tc and VX-1Pro were immediately embraced by the sport's elite anglers. Relied upon by the top-ranking competitive teams on the professional tournament trail, MarCum LX flashers have accounted for every North American Ice Fishing Team-of-the-Year title in NAIFC circuit history. • Multi-Dimensional Sonar interface gives user maximum flexibility and the broadest underwater perspective. LCD windows include "water column vertical," vertical zoom, flasher-dial and traditional widescreen graph displays. • Industry-exclusive Sonar Footprint™ Technology displays a 3-dimensional scan area of bottom coverage at any depth, with either 8o or 20o transducer cone angles. 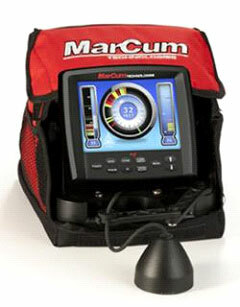 • Classic MarCum patented features-Infinitely Adjustable Zoom, Interference Rejection (IR), Auto Range, etc. • Dynamic Depth™ Interface with auto-populating sonar ranges maximize display area for superior resolution at all times. • Fully user-defined "Dashboard" displays digital depth, battery voltage, range, gain, IR, target adjust, or any combination. • Includes rechargeable 12-volt 9amp battery, charger and softcase. In response to recent cuts in the federal budget, the FWS has proposed an $11 million reduction in National Fish Hatchery System (NFHS) funding, with $6 million coming from the account for operating mitigation hatcheries. The U.S. Fish and Wildlife Service's National Fish Hatchery System is responsible for stocking many of our nation's waters with the fish that anglers enjoy pursuing. Federal hatcheries across the U.S. raise and release millions of recreationally-important species such as rainbow trout to mitigate for the loss of native fisheries due to water development projects. If approved, this large reduction will result in the closure of nine hatcheries, seven of which are located in the southeastern U.S., greatly reducing angling opportunity in the region. The impacts of these closures will hit both anglers and local economies hard, as the operations of these hatcheries help support over 3,500 jobs and have an annual economic impact of over $325 million. the Tennessee Valley Authority. If the FWS does not receive full reimbursement for these efforts, they have proposed stopping operations at these nine hatcheries. If this happens, recreational fishing opportunities, especially in the southeastern U.S., will be severely reduced. Click here to: Send a message to your Members of Congress urging them to take the necessary actions to restore the NFHS budget and keep our nation's hatcheries operating. The U.S. Fish and Wildlife Service, on July 5 announced a proposal to open Crane Meadows National Wildlife Refuge in Minnesota to deer and turkey hunting for the first time, while expanding hunting activities at nine other refuges in eight states. If approved, the proposal would provide additional public hunting opportunities in fulfillment of the National Wildlife Refuge System Improvement Act of 1997. “For decades, the National Wildlife Refuge System has offered some of the nation’s best public hunting and fishing, helping to connect generations of Americans to their sporting heritage. The Fish and Wildlife Service is committed to expanding these opportunities wherever they are compatible with refuge purposes,” said Service Director Dan Ashe. ►Arapaho National Wildlife Refuge, CO, would increase big game hunting by offering elk hunting for the first time. The refuge also allows migratory bird hunting, upland game hunting and fishing. ►Bayou Sauvage National Wildlife Refuge, LA, would open for the first time to migratory bird hunting of waterfowl and coot. The refuge also allows fishing. ►Coldwater River National Wildlife Refuge, MS, would open for the first time to migratory bird hunting of duck and geese; upland game hunting of squirrel, rabbit and raccoon; and big game hunting of deer and hogs. The refuge also permits fishing. ►Currituck National Wildlife Refuge, NC, would open for the first time to big game hunting of deer and hogs. ►Minnesota Valley National Wildlife Refuge, MN, would increase acreage for migratory bird hunting, upland game hunting and big game hunting. ►Northern Tallgrass Prairie National Wildlife Refuge, MN/IA, would increase acreage for migratory bird hunting, upland game hunting and big game hunting. The refuge would expand the species for migratory bird and upland game hunting. first time upland game hunting of turkey and big game hunting of elk. The refuge also allows migratory bird hunting and fishing. ►Sherburne National Wildlife Refuge, MN, would open new areas to migratory bird hunting. It would allow big game hunting of turkey and deer for the first time. The refuge is also open for fishing. ►Trinity River National Wildlife Refuge, TX, would open three new units to upland game hunting of squirrels and rabbits and big game hunting of feral hogs and white-tailed deer. The refuge is also open for migratory bird hunting and fishing. Hunting is an important tool for wildlife management, giving resource managers a valuable tool to control populations of some species that might otherwise exceed the carrying capacity of their habitat and threaten the well-being of other wildlife species, and in some instances, that of human health and safety. Under the National Wildlife Refuge System Improvement Act of 1997, the Service can permit hunting and fishing as well as four other types of wildlife-dependent recreation where they are compatible with refuge purpose and mission. Hunting, within specified limits, is permitted on more than 300 national wildlife refuges. Fishing is permitted on more than 270 national wildlife refuges. Other wildlife-dependent recreation on national wildlife refuges includes wildlife photography, environmental education, wildlife observation and interpretation. Notice of the proposal was published in the Federal Register on July 5, 2011; the public has until August 4, 2011, to provide comments. Jeff Wasil, emissions certification engineer for Bombardier Recreational Products' Evinrude Marine Engine division, testified Thursday on behalf of the National Marine Manufacturers Association at a congressional hearing titled "Hitting the Ethanol Blend Wall: Examining the Science on E15." Academy of Sciences survey of scientific information related to the effects on engines of ethanol blends greater than 10 percent. "Hydrologic separation is the only option which closes the aquatic connection between the two basins (Great Lakes and Mississippi River) and does not require continuous operation and maintenance of various technologies that have some risk of failure", is the finding of a peer-reviewed science paper released last week. "Aquatic Invasive Species Risks to the Great Lakes and Mississippi River Basins," is authored by Jerry Rasmussen, Henry Regier, Richard Sparks and William Taylor -- all distinguished U.S. and Canadian researchers from the Great Lakes and Mississippi basins. The paper has been posted on the website of The Journal of Great Lakes Research (IAGLR) and will be published in an upcoming issue. The four noted scientists assert "electric barriers have not been fully effective on Asian carp and will not work on organisms or propagules (any structure capable of being propagated or acting as an agent of reproduction) that drift downstream; eDNA evidence suggests silver and bighead carp are in the Chicago waterways well upstream of the electric barriers." The study recognizes the one-time, "capital cost to separate the two basins is widely acknowledged to be high, and the outstanding question is whether the costs are justified given the significant risk of future ecological damages and long-term economic losses." The study group challenges four existing assertions: (1) existing electric barriers in the Chicago canals are effective; (2) it is too late–the carps are already in the Great Lakes or soon will be; (3) Asian carps will not thrive in the Great Lakes due to inadequate food and spawning habitat; and (4) Asian carps are unlikely to cause serious harm. 1. Existing electric barriers (constructed in the Chicago Sanitary/Ship Canal to prevent migration of harmful aquatic species) have proven effective in blocking Asian carp; Asian carp recently captured on the Lake Michigan side of the barrier arrived by other means (Frede, 2010). 2. Asian carp have already found their way into the Great Lakes, or soon will, through various means such as the dumping of bait buckets by anglers or intentional transfers—therefore it is too late to prevent the invasion (Frede, 2010; McCloud, 2010; Stanek, 2010). 3. Asian carp will not thrive in the Great Lakes due to a lack of adequate food and spawning habitat (Flesher, 2010; Golowenski, 2010). 4. Asian carp are not likely to cause serious damage to the Great Lakes ecosystem (Smith and Vandermeer, 2010). Despite claims to the contrary, the four noted and well respected scientists claim that it's not too late to keep the carp out of the lakes. Those who believe that too much is being made of an Asian carp invasion of the Great Lakes downplay the risk, claiming Asian carp will simply join the many species that are now accommodated by the Great Lakes ecosystem. The paper’s authors note the existing electric barriers in the Chicago Sanitary and Ship Canal are designed to repel, not kill fish, and most experts agree that permanent solutions to block Asian carp and other harmful aquatic species from invading the Great Lakes must look beyond electrical barrier systems. One of the greatest deficiencies of electrical barriers that allow the free flow of water and boats are their inability to block downstream movements. Electric fields cannot prevent downstream migration and drifting of invertebrates, fish eggs and larvae, and potentially harmful plants, parasites and disease organisms. While acknowledging that to date, there is no evidence of reproducing populations of Asian carps in the canals upstream of the electric barriers or in Lake Michigan, but given enough time, even low probability events will ultimately occur. Food sources and potential spawning areas in the Great Lakes and tributary rivers are available to support bighead and silver carp, despite assertions to the contrary that were based on misrepresentation of one bioenergetics paper (Cooke and Hill, 2010). The authors also reminded us food availability was one of many factors considered in a Canadian government risk assessment that concluded it is reasonably certain that bighead and silver carp will reproduce and spread in the Great Lakes if they are provided access (Mandrak and Cudmore, 2004). which equates in North America to the latitude of Lake Superior, or about 100 miles north of Lake Huron and almost 300 miles north of Lake Ontario. The native range of silver carp extends to 54° north, which cuts across the southern basin of Hudson Bay. Twenty-two tributaries on the United States side of four Great Lakes are at least 100 km long and may have sufficient current velocity to keep Asian carp eggs in suspension long enough to hatch (Kolar et al., 2010). The authors are urging Congress to approve legislation ordering the Army Corps of Engineers to quicken a study of whether to divide the two freshwater basins, now due for completion in 2015. Legislation from Congress in 2007 (Water Resources Development Act) authorized the U.S. Army Corps to conduct "a feasibility study of the range of options and technologies to prevent the spread of aquatic nuisance species between the Great Lakes and Mississippi River Basins through the Chicago Sanitary and Ship Canal and other aquatic pathways." However, more than three years passed before the USACE issued the study's first Draft Project Management Plan, and the completion date for the study has been stalled to 2015. The electric barriers have not been fully effective on Asian carp and will not work on organisms or propagules (any structure capable of being propagated or acting as an agent of reproduction) that drift downstream; eDNA evidence suggests silver and bighead carp are in the Chicago waterways well upstream of the electric barriers. Based on our current understanding of Asian carp dietary and habitat requirements it is unlikely they would be limited by food or habitat in the entire Great Lakes basin. The addition of two more species of plankton feeders to the Great Lakes would adversely affect an already stressed food base. There are more invasive species besides the Asian carps that could cause species extinctions, declines of valuable fisheries, and other economic losses if they pass between the Great Lakes and Mississippi basins via the Chicago connection. It is imperative to stop the exchange of invasive species as quickly as possible. The pending legislation needs to be passed, so the public and their elected officials can evaluate the costs and relative risks based upon the best scientific information and engineering technology available. Jerry Rasmussen, is a retired U.S. Fish and Wildlife Service biologist who first warned of the Asian carp threat more than a decade ago; he was almost fired by one of President Bill Clinton's henchman for rocking the boat about the ponds in Arkansas and Missouri using invasive Asian carp for environmental purposes; Henry Regier, is a Great Lakes researcher at the University of Toronto; Richard Sparks, with the National Great Rivers Research and Education Center in Godfrey, IL is a longtime member of the Electronic Waterway Advisory committee, and William Taylor, Distinguished Professor, Michigan State University, is a commissioner of the Great Lakes Fishery Commission. Other than a few scattered showers and thunderstorms, the Great Lakes basin enjoyed a very nice summer week. Temperature mostly reached the upper 70s and low 80s, under abundant sunshine. A weak disturbance may bring a few scattered showers and thunderstorms Friday and Saturday, but most of the basin should see sunny skies and warm temperatures. Precipitation through the first week of July is above average in the Lake Superior basin and below average in the remaining Great Lake basins. Currently, Lakes Superior is 2 inches above its level of a year ago, while Lake Michigan-Huron is 1 inch above its level of a year ago. Lakes St. Clair, Erie, and Ontario are 6, 9, and 11 inches, respectively, higher than they were at this time last year. Over the next thirty days, Lake Superior is projected to rise 2 inches and Lake Michigan-Huron is expected to remain at its current level. The water levels of Lakes St. Clair, Erie, and Ontario are forecasted to decrease 5, 5, and 8 inches, respectively, over the next month. Lake St. Clair into the Detroit River, are expected to be below average throughout the month of July. Lake Erie's outflow through the Niagara River is predicted to be above average and the outflow of Lake Ontario into the St. Lawrence River is predicted to be above average. A new Rasmussen Reports national telephone survey finds that 42% of all likely U.S. Voters hold at least a somewhat favorable opinion of the NEA, with 17% Very Favorable. Thirty-seven percent (37%) regard the teacher’s union at least somewhat unfavorably, including 22% with a Very Unfavorable view. Twenty percent (20%) are not sure what they think of the group. Among Democrats, however, 60% view the NEA favorably, while 57% of GOP voters regard the union unfavorably. Voters not affiliated with either of the major parties are narrowly divided. Similarly, while 55% of the Political Class holds a favorable opinion of the NEA, the plurality (45%) of Mainstream voters does not. unfavorably by 41%, with 25% who have a Very Unfavorable view. Yet while 80% of Republicans and 53% of unaffiliated voters share a favorable opinion of the NRA, 63% of Democrats view the group unfavorably. Seventy-five percent (75%) of the Political Class don’t care for the NRA, but 61% of Mainstream voters regard the group favorably. The Sierra Club is one of the nation’s most prominent environmental organizations, but 33% of voters have no opinion of the group. Thirty-five percent (35%) view the Sierra Club favorably, including 12% with a Very Favorable opinion. Thirty-two percent (32%) share an unfavorable view of the organization, with 16% Very Unfavorable. Democrats are inclined to have a positive view of the Sierra Club, while Republicans tend to see it in a negative light. Unaffiliated voters have more mixed feelings. Thirty-six percent (36%) of Americans say the United States needs stricter gun control laws, but 56% don’t share that belief and oppose stronger anti-gun laws. Now that Wisconsin has allowed for residents to carry a concealed weapon in public, Illinois stands alone as the final State to object to legalizing concealed handguns, The Associated Press reports. Wisconsin’s law will take effect November 1.
news source stated. The news source reports that those on both sides of the argument agree Chicago will be the deciding factor in the dispute. “It’s about as anti-gun a city as one could find,” Harry Wilson, a gun control expert at Virginia’s Roanoke College, told the news provider. WILD ROSE, Wis. -- Nearly 3 million walleye have been stocked in dozens of lakes and rivers waters over the last few weeks. The fish, up to 2 months old and 2 inches in size, were harvested from the Art Oehmcke Hatchery in Woodruff, the Tommy G. Thompson Hatchery in Spooner, the Lake Mills Hatchery in its namesake community, and, for the first time in 20 years, Wild Rose State Fish Hatchery in Waushara County. Construction of new coolwater facilities at that century-old hatchery allowed fish crews there to return to producing walleye for the first time in a generation. "It was a good year for small fingerling walleye production, and it's good news for future walleye fishing opportunities in Wisconsin," says Dave Giehtbrock, statewide fish production manager. "The longer winter led to later egg collection, which caused a logistical complication at some hatcheries, but the cooler water temperatures were good for the walleye, and we were able to pull off successful rearing at our hatcheries, producing the fish we needed to produce." The walleye are stocked to provide walleye fishing opportunities where otherwise there would be none, and to help restore naturally self-sustaining walleye populations in the receiving waters. The vast majority of the state's walleye fisheries are naturally reproducing but stocking plays an important role in some waters. How long it takes these little guys to reach legal size depends on the water where they're stocked and regulations, but count on two to five years before these fish are likely to turn up in the frying pan. The fish have been raised at the four hatcheries for the last month or two, living in hatchery ponds that DNR fertilizes to help fuel production of algae. Zooplankton in the pond eat the algae, and the young fish eat the zooplankton. Now, that the plankton and algae supplies are depleted, it's time to get the fish out before they start eyeballing one another. More information on state fish hatcheries is available on the DNR website. Measures the government is taking to keep the invasive Asian carp -- a species that threatens to topple the Great Lakes ecosystems -- out of Lake Michigan are working, officials said Thursday. Thousands of dead fish are washing up on the shores of Lake Michigan. Experts said small, shiny fishes, called alewives, have been dying off and showing up on beaches around Lake Michigan in recent weeks. A lot of people are worried about Asian carp swimming into the Great Lakes. We know from experience how bad an invasive species can be. Sea lamprey devastated the Great Lakes fishery in the 1940s and 50s, and they still kill a lot of fish. The possibility that Asian carp could make their way up the Mississippi River into Minnesota has state officials worried. Representatives from the Minnesota DNR, the U.S. Army Corps of Engineers, the Fish and Wildlife Service, and other agencies have teamed up to draft a response plan. Groups of scientists around the Great Lakes have gotten louder in their pleas to close the connection between the lakes and the Mississippi River basin. Citizens and politicians need to take note. Legislation about to be signed by Gov. John Kasich regarding the amount of water that can be legally drained from Lake Erie was supposed to bring the state into compliance with the Great Lakes Compact. But there is disagreement about whether it will achieve that goal.